Perhaps you have heard critiques of penal substitution based on the fact that it seems rooted in divine violence, which in turn supports violence within families and social structures. Perhaps you have heard debates between adherents of different views of Christ’s work, both of which seemed important and warranted. Perhaps all you can think of when you hear “atonement” is “Jesus died for my sins,” or Reformed arguments of limited atonement. But the task of the church is not to determine which is the theory of the atonement, or which theory of the atonement has pride of place among others. Rather, following Aquinas (who stands clearly in line with the majority position of the history of theology), we ought to witness to the fittingness of the atonement: to demonstrate how the death and resurrection of Jesus Christ brings together a wide array of benefits for the sake of the reconciliation of all things to God, that we might have as full an understanding as possible of the work God accomplished in Christ. Accordingly, one of the governing images behind my book is one of exceeding riches, of a treasure-trove. I reject the pursuit of the one theory of the atonement that is at the heart of the biblical witness and allows us to account for and systematize the others, and the ensuing temptation to fight skirmishes with other competing theories. Rather, the goal of this book is to explore, understand, cherish and employ the abundant riches we have in Christ—the host of necessary, fitting and mutually complementary theories of Christ’s saving work which are founded in Scripture and developed throughout the history of the church. For “it is impossible to designate this dramatic climax in the relations between God and man with a single, isolated concept…. There can only be a dénouement when all the dimensions of the mystery are before us” (von Balthasar, Theo Drama IV: The Action, 229). Although theology is certainly confronted with the one God, he is One in the fullness of his existence, action, and revelation. In the school of the witness theology can in no way become monolithic, monomanic, monotonous, and infallibly boring. In no way can it bind or limit itself to one special subject or another…. The eternally rich God is the content of the knowledge of evangelical theology. His unique mystery is known only in the overflowing fullness of his counsels, ways and judgments (Barth, Evangelical Theology, 33-4). And nowhere is this more the case than in the doctrine of the atonement—for here we have the fullness of God reconciling all things to himself in the fullness of time, in the face of the fullness of our sinful opposition to him and its consequences. Our theme is superabundant fullness of riches grounded in the eternally rich God and employed in the saving work of Christ. For “salvation comes from God, is wrought by God, and is for God,” and it is by dwelling on the riches of this God wrought upon and for us that we properly understand his saving work (Davidson, 14). How does this approach differ from other standard approaches? In the way that it works with the given data of different images and theories throughout the Bible and the history of theology. Rather than focusing on these theories and their relationships as the primary task of the doctrine, I argue that our approach should be to explore the underlying reason for the complexity of Christ’s saving work—by rooting this diversity in the underlying diversity proper to the eternal life of the triune God, thereby following Barth in allowing “the eternally rich God” to be “the content of the knowledge of [an] evangelical” doctrine of the atonement (Barth, 33-4). By means of this approach, we will sample the breadth of answers we should give to the question of why Christ died and rose again. For while the answer is not simple, there is an answer nonetheless—an exceptionally rich, varied and multi-faceted answer, rooted in the diversity proper to the God whose act this is, which sheds light upon every area of Christian doctrine and practice. 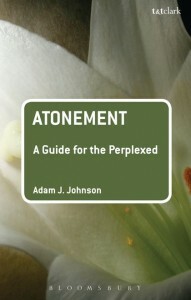 For a copy of Dr. Johnson’s book, Atonement: A Guide for the Perplexed, please visit Amazon.com. He has copies in his office available at a discount ($22).